Total Balance Method is a comprehensive holistic course of study that enables dog or horse owners to contribute to the comfort, longevity, and functionality of their animal athletes or companions. This is accomplished through the development of skills in Traditional Chinese Medicine, massage therapy, chakra energies, proper stretching techniques, and the application of essential oils. Athletes who receive massage therapies as part of their training routine perform at a higher level with fewer injuries. In rehabilitation from injury, massage has proved pivotal not only in returning the athlete to the sport but also in preventing re-injury. Traditional Chinese Medicine techniques-including acupressure, Five Elements, meridian, and other therapies-enhance the body’s receptive powers to holistic care. These truths extend to both horse and dog athletes. 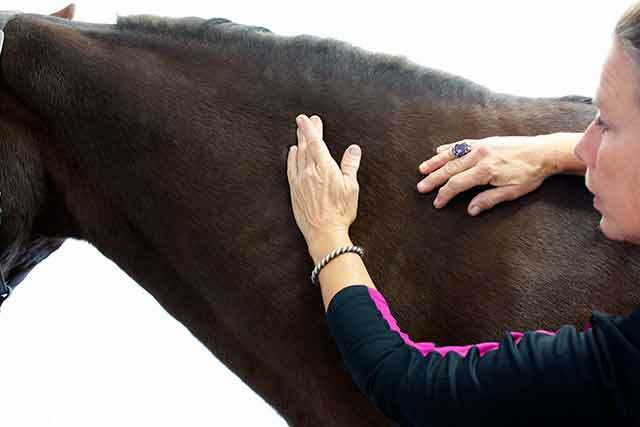 During her more than twenty years of therapeutic practice, course developer Dawn Cooper found that both dog and horse owners wanted to be actively involved in the preventative and rehabilitation therapies of their animals. To facilitate this, she investigated many avenues of holistic animal care. What she discovered was that each therapeutic technique provided its own layer of improvement. When these therapies were combined, the results were spectacular. She developed the Total Balance Method to enable owners to provide the proper blend of therapies for their individual animal. The TBM course is designed for home study. Students are meticulously guided through each therapeutic skill, which they can apply to their own dog or horse as part of the course work. This format provides them with unique insight into their own animals’s baseline issues and remedies, while also equipping them to apply their new skills to other animals, since the course also teaches the principles behind each procedure. The course format also includes tutoring through regular telephone conferences and personal contact with the instructor. Students are nurtured through the course at their own rate, and questions are always welcome -- even after the completion of the course of study.